Learn French in Antibes at our partner French school, CIA. CIA has 3 locations in which French courses are taught, 'Le Chateau', 'Le Port' and 'Juan-les-Pins'. Juan-les-Pins is where the school's summer French youth course take place. This part of the French language school is situated in the outskirts of Antibes, and is specifically designed to cater for teenage French language students aged 14 - 18 years. A variety of exciting half-day and full day excursions including Saint Paul, Eze, Nice and Saint Tropez. The school can also make special arrangements for scooter or car-hire. The intensive course includes 20 French lessons of 45 minutes per week. There are a maximum of 12 students per class. Work on oral and written expression and comprehension. If you would like to take a more intensive course, you can choose the course of 25 or 30 lessons per week. The intensive courses of 25 or 30 lessons per week include 20 French lessons of 45 minutes per week in groups with a maximum of 12 students per class plus an extra 5 or 10 lessons in groups with a maximum of 6 students per class. A basic knowledge of French is required for this course. Minimum course duration of all courses is one week and the courses are offered in 9 different levels. The intensive course of 30 lessons require a basic knowledge of French. A double room in a host family can only be booked by students younger than 25 years old. Older students can only book a double room if they travel together. It is possible to book a gluten free diet in host family, 20 € per week p.p. A double room in a residence can be booked by students younger than 30 years old. Older students can only book a double room if they travel together. The airport transfer only is included upon arrival at weekends when you book accommodation in a host family. If you book another accommodation, this service is not included. The price stated is for an arrival transfer at Nice airport at weekends. It is also possible to book a transfer upon arrival at Antibes train station for € 15 p.p. Arrival and departure transfers are only guaranteed from 6.30 am to 9 pm (residences and host family). That means that for all transfers after 9 pm and before 6.30 am, you have to book a taxi (around 60€-80€/trip). Please let us know on the bookingform ('remarks') which transfer you would like to book. The price for an airport transfer upon arrival for the family course is €60,- (price per family). For arrivals on Saturday on Sunday between 6.30 and 21.00. In 2019 the school is closed on 01/01/2019 - 06/01/2019, 22/04/2019, 01/05/2019, 30/05/2019, 10/06/2019, 15/08/2019, 01/11/2019, 11/11/2019, and from 21/12/2019 to 05/01/2020. Missed lessons due to bank holidays will not be refunded or rescheduled. Only one to one lessons will be rescheduled. The mini group course 30+ includes 20 French lessons of 45 minutes per week in groups with a maximum of 12 students per class. Lessons take place in the morning. This course is suitable only for students aged 30 or more. The mini group course requires an intermediate level of French. 2 weeks: 11/02/2019, 29/04/2019, 06/05/2019, 13/05/2019, 20/05/2019, 27/05/2019, 03/06/2019, 11/06/2019, 17/06/2019, 24/06/2019, 01/07/2019, 08/07/2019, 15/07/2019, 22/07/2019, 29/07/2019, 05/08/2019, 12/08/2019, 21/10/2019. 3 weeks: 29/04/2019, 06/05/2019, 13/05/2019, 20/05/2019, 27/05/2019, 03/06/2019, 11/06/2019, 17/06/2019, 24/06/2019, 01/07/2019, 08/07/2019, 15/07/2019, 22/07/2019, 29/07/2019, 05/08/2019. The DELF exam course in Antibes consists of 20 or 30 lessons per week and prepares for A2, B1 and B2 level. Apart from general French lessons (grammar, vocabulary, speaking and listening) you will also prepare for the exam during the course, using specific materials for the test. The course of 20 lessons usually takes place between 9.00 and 12.20 hours. If you choose the course with 30 lessons, you will also have lessons from 14.00 to 16.00 hours for 4 days a week. (times are subject to change). The maximum number of students is 12 in the morning en 6 in the afternoon (for the course with 30 lessons). Exam fees are not included in the price (approx. 120 EUR). The DELF course with 30 lessons is also possible for a duration of 4 and 6 weeks, for the course with 20 lessons this is not possible. 4 weeks (30 lessons/week) : 28/01/2019, 04/03/2019, 23/04/2019*, 20/05/2019, 24/06/2019, 29/07/2019, 23/09/2019, 21/10/2019, 18/11/2019. A duo course is where the participants define their objectives to create an individual programme adapted to their level and learning pace. It is a class for two students. The duo course can only be booked by two people who travel together and have the same level of French. This course can only be booked by two people who travel together and have the same level of French. The one-to-one course is perfect for those who want to optimise their study time. The aim of the one-to-one course is to offer a fully personalised method of teaching designed to meet your specific needs and desires. As the classes are private, you will be able to decide the schedule and content. 20 lessons per week. Are you around 50 years old and would like to learn French with people of similar age and interests? Then the Club 50 in Antibes is a great choice to improve your language skills whilst you meet very nice elderly people. For your convenience, you can find the official starting dates on our online price list. If you are not able join the course on these dates, of course, you can participate in an Intensive Course since our partner school in Antibes has a great nationality/age mix all the year round. To participate in the club 50 course, an A1 level (elementary) is required. This course is not suitable for absolute beginners. The social programme is developed exclusively along with Club 50 students. Students booking the Club 50 course receive half board (breakfast and lunch) in the school's restaurant Monday to Friday. This accommodation can only be booked in combination with a Club 50 course. The Business French course in Antibes is especially developed for those students with a certain level of French who would like to acquire vocabulary and language skills of this field. The programme consists of 30 lessons per week in a small group of 4 students max. In the morning classes (from Monday to Friday, 9.00 to 12.20 am) lessons are focussed on improving vocabulary by reading business documents. In addition to this, lessons emphasize on real or simulated situations in which students participate. During four afternoons per week (from Monday to Thursday) participants will be learn more about a typical French company, tax system in France and telephoning conversations. Please, bear in mind that you need to have a B1 level of French to participate in this programme. 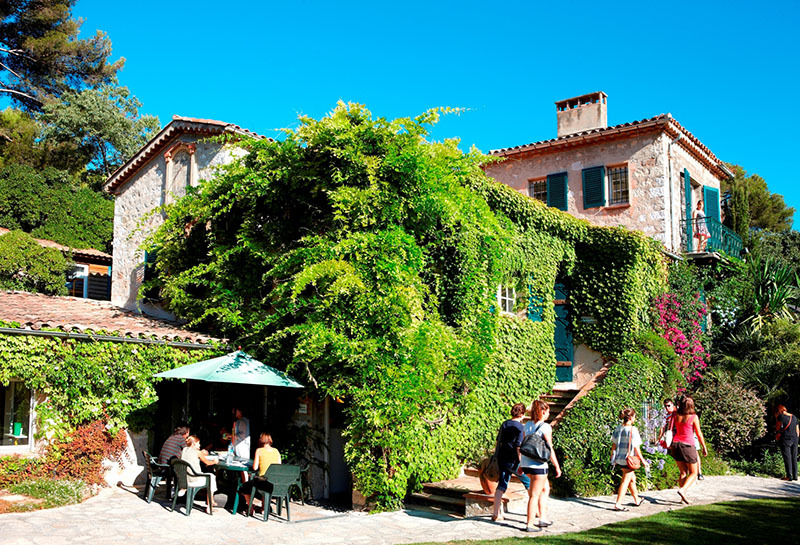 Combined course in Antibes consists of 20 group French lessons + 4 private tutions per week. During the private lessons, you have a teacher at your disposal to solve all the questions or doubts you might have about the language or you can just use the lessons to improve your coversational skills. Looking for French Courses in the French Riviera for the whole family during summer? If so, this is just what you need. We have language courses available to adults and their 6-17 year old children! This is a very convenient language programme since the parents and the kids/teenagers have lessons at the same time (from 9:00 to 12:00 am Monday to Friday) in separate groups and at separate levels. Juniors aged 8-17 years have lessons separated by groups according to their age and language level. For the younger children of 6-7 years old, immersive French is taught using games and fun activities, which is more effective for these ages. Juniors aged 12-17 years have 20 French lessons a week in groups seperated according to age and language level. For the 8-11 year olds, immersive French is taught (using games and fun activities), meaning outside of the summer there is no program available for 6-7 year olds. All the teenagers, juniors and children have lunch included at the school. If you want to book a whole programme for your children with activities and excursions included, you can book the childrens course with activities. Accommodation is not included in the price of these programmes, however, it is possible to book a studio or apartment for your family (prices on request). Parents must pick the children/juniors up after lunch or after activities when they take part in the complete package. The prices of the family course do not include accommodation. It is possible to book accommodation, please contact us for more information and prices. Are you planning to complete a French course abroad along with your family in summer? Then, our family programme in Antibes is a great opportunity to learn the language all together whilst having holidays in the beautiful French Riviera. Parents and children have French lessons with the same timetable (9:00-12:20 am, Monday to Friday) in separate groups and levels. For the children, French is taught by using games and fun activities, which is more effective for these ages. Additionally, children have lunch at the school included in the cost of the course. Our online prices only include the course, however you can also book the accommodation through us. There are studios or private apartments available (prices on request). Parents must pick the children up after lunch. It is not possible to book more than 20 lessons per week due to the programme’s structure. This course is only available in summer and must be booked along with the Family course for parents. This course is available from 23/06/2019 till 24/08/2019 (=last day of classes). The program for the 6-7 year olds is only available on dates during the summer and consists of fun morning activities and lunch (while the parents have their own regular intensive course). If you are looking for a French course abroad for the whole family in summer, then our family programme in Antibes is an excellent opportunity to improve/learn French all together whilst having fun exploring one the most beautiful cities in the French Riviera. Parents and juniors aged 8-17 have 20 French lessons per week with the same timetable (9:00-12:20 am, Monday to Friday) in separate groups and levels. Additionally, juniors have lunch included at the school. You can also book the course with activity package (see prices of the Family course/ juniors incl. activities), which includes breakfast and lunch, excursions and half-day activities. This way, juniors will have lessons in the morning and activities in the afternoon (parents will pick them up around 18:30). Our online prices only includes the course, however you can also book the accommodation through us. There are available studios or private apartments (prices on request). Parents must pick up the children/juniors after lunch. It is not possible to book more than 20 lessons per week due to the programme’s structure. The family course for children (8-17 years) includes the course and lunches at school. In case you also want to book an activity and excursion programme, you can book the family course for children (8-17 years) incl. activities. This summer family course for children between 8 and 17 years old enables both children and their parents to take French classes simultaneously. The lessons take place from 9:00 till 12:00 from Monday till Friday, inclusive. For the children the course includes a lunch at school and fun activities and excursions after lunch. Accommodation is not included in this course, but can we can book either a studio or an apartment for you (prices upon request). This program can only be booked in combination with a family course for parents. The family course for children (8-17 years) + ACTIVITIES is a full package including the course, lunches, excursions and activities. This spring/autumn family course for children between 8 and 11 years old enables both children and their parents to take French classes simultaneously. The lessons take place from 9:00 till 12:00 from Monday till Friday, inclusive. Students are grouped depending on their level of French. The children’s classes will be interactive so that they can learn French in a playful way. The course includes said classes and a lunch. This course does not include any after-lunch activities. This course is available from 07/04/2019 till 22/06/2019, and from 25/08/2019 till 26/10/2019 (=last day of classes). The program for the 8-11 year olds DURING SPRING/AUTUMN consists of fun morning activities and lunch (while the parents have their own regular intensive course). This spring/autumn family course for children between 12 and 17 years old enables both children and their parents to take French classes simultaneously. The lessons take place from 9:00 till 12:00 from Monday till Friday, inclusive. For the children the course includes a lunch at school, but it does not include any activities after lunch but you can book this course in combination with activities, too. This course is available from 07/04/2019 till 22/06/2019, and from 25/08/20190 till 26/10/2019 (=last day of classes). The family course for children (12-17 years) DURING SPRING/AUTUMN includes the course and lunches at school. In case you also want to book an activity and excursion programme please book the family course + ACTIVITIES. This spring/autumn family course for children between 12 and 17 years old enables both children and their parents to take French classes simultaneously. The lessons take place from 9:00 till 12:00 from Monday till Friday, inclusive. For the children the course includes a lunch at school and fun activities and excursions after lunch. The family course for children (12-17 years) + ACTIVITIES DURING SPRING/AUTUMN is a full package including the course, lunches, excursions and activities. The selected host families will offer you a welcoming house where you will be able to speak French easily. While staying in a host family, you will be in a full immersion. So, you will be able to learn the French culture and share the life of your hosts. Your accomodation will be located in Antibes / Juan les Pins, close to the French school (a few minutes walk). The medium-standard residences are located at approximately 20 minutes walking distance from the school and consist of 45 (different) en suite rooms. There is a bar / restaurant, swimming pool and terraces that you share with the residents of the adjacent high-standard residences. Since there is discotheque on the premises, the residence is the meeting point for most of the students. There is a transfer service to school every morning. The stay is based on no meals. In the residential area of Antibes Juan-les-Pins, one will find the two student residences on the same grounds that are exclusively reserved for the students. The Provençal moderately sized, studio apartments of High-standard residence have private kitchenettes and their own TV, small refrigerator and sink. The High-standard residence offers 15 studios on 2 floors each with a terrace overlooking an enclosed garden and some allow multiple occupancy. Occupants of both residences (High-standard and Medium-standard) also share a delightful pool next to a large outdoor patio, with a Café bar on the premises for wine, beer or espresso, and recreation room nearby. Beautiful palm and tangerine trees with other colourful flora are perfect for leisure activity or a place to do homework after class. The recreation room has beverage and snack vending machines, a billiard table, ping pong tables and a TV, video and CD player for all to enjoy their favorite movies (in French of course!) with subtitles of your own choice. Free parking is available around the residential estate with an olive grove and a small park nearby for peaceful time to yourself. Within the vicinity of each residence are sandy beaches to enjoy the magnificent view by the sea and all the tourist attractions and shops along this small seashore town on the Côte d’Azur. Participants of the 50+ course can choose accommodation in a studio. You will have your own bathroom and a small kitchenette, meaning you have all the privacy you need. The studio’s are located in the high-standard residence, at approximately 20 minutes walking distance from the school. All studio’s have air-conditioning and TV. Students booking the Club 50 course receive half board (breakfast and lunch) in the school's restaurant Monday to Friday.